Rustin was one of the earliest members of CORE and its first field secretary. Much of the staff for the MOW working in its Harlem office were CORE members: Norm and Velma Hill, Tom Kahn, Rachelle Horowitz, Penn Kemble, Sandy Feldman, Blyden Jackson, Eleanor Holmes (Norton), Elliot Linzer. Most of these people were also socialists and members of the Socialist Party of America. Thanks to Monte Wasch, who worked on the MOW with Rustin and Sy Posner, for the photo. Both Wasch and Posner were part of Bronx CORE's White Castle demonstrations. Posner is the 'pudgy white guy' standing to the right of Rustin. 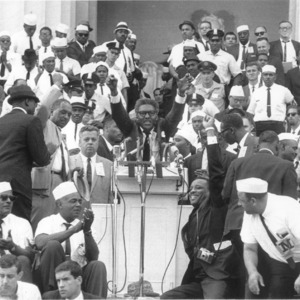 “photo of Bayard Rustin at the March on Washington,” corenyc.org, accessed April 21, 2019, http://www.corenyc.org/omeka/items/show/254.